Three killers have been jailed for a second time after their first murder convictions were quashed as a police officer working on the case hid the fact she knew one of the trial jurors. 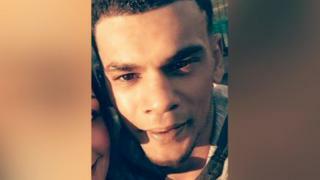 Lynford Brewster, 29, died from stab wounds in Llanedeyrn, Cardiff, in 2016. Jake Whelan, 26, Robert Lainsbury, 25, and Dwayne Edgar, 31, were convicted after a trial at Bristol Crown Court. All received life sentences, with Whelan given a minimum of 28 years, Lainsbury 26 years and Edgar 25 years. The re-trial came because South Wales Police Det Con Rebecca Bryant, a liaison officer to Mr Brewster's family, did not disclose that her son's girlfriend was sitting on the jury at Cardiff Crown Court during the original case. The three men, who were jailed in December 2016, had their convictions quashed as a result and the re-trial - estimated to have cost more than £2,500-a-day - was ordered. On Tuesday, they were jailed for a second time following a seven-week trial. Father-to-be Mr Brewster was stabbed during a row with drug dealer Whelan after the three had gone to look for him armed with knives. The victim's mother, June Whittaker, said: "He was no angel but he was my son, and life has not been the same since his death." Sentencing, Mr Justice Morris said: "This was a brazen, vicious and brutal attack by the three of you, hunting down an unarmed man who was running away. "At no stage have any of you shown any remorse for what you have done nor for the enduring misery you have caused others."